Very wonderful flavor tea, very good package and quick delivery. Great website to chose good tea. Fresh green vegetal liquid on the palate.Lovely aroma.I can see now whyXi Hu is the standard. A very nice green tea to have in the morning. I will purchase again. Excellent green tea. Earthy taste. Nice textured leaves. Lovely clean tasting tea! I am truly enjoying it, a nice treat from my everyday Long Jing. Excellent high quality tea with a beautiful nutty aftertaste. Overpriced for the quality. This is quite simple and one-sided example of LJ, with overly strong nuttiness and little else. This isn´t bad, but for this price one would expect more balanced tea. I really like this tea-- it´s not as good as the emperor, but it´s a lot more affordable-- I usually mix the two together. It´s a pleasure ordering from TeaSpring-- Their customer service is great! A great tea! This Long Jing is fine and have a nut taste. Been left disappointed by this tea 2 years running. Was excellent when they came in the original ShiFeng packaging. This one has a different character than Emperor Long Jing, but is still excellent. I like the difference, and vary between the two. Thanks for the excellent products! A very good long jing. Exactly what I expected, which is a good thing! Excellent refreshing tea. As well as the taste, it has the added property of the memory of my visit to China! Different than the Emperor, but equally delicious! Thank you! Buon lung ching dalle belle foglie lunghe e ancora molto verdi. Il profumo caratteristico di questo tè è molto accentuato e in infusione produce un tè dal corpo decisoe dal sapore fresco erboso. Non il migliore che ho provato ma buono. This tea has a light green color and subtle flavorful taste. However, I found some small white balls among them and have to pick them out. This long jing is not of the highest quality. I prefer when long jing has a very strong and nutty aroma with a bold aftertaste. This particular variety, while satisfactory, does not have the sort of strong and evolving flavour that I tend to prefer. The only other Long Jing I can compare this to is from an unknown source at my local grocery store. The local grocer Long Jing has broken leaves. Lion Xi Hu tastes excellent. Buttery, vegetal, sweet, refreshing. Great for special occasions, perhaps too expensive for a daily tea. I would say the overall taste is satisfactory for the price paid. Not the best quality around. Beautiful taste and aroma. Another tea that I would highly recommend! Absolutely outstanding again. This tea is incredibly sweet; I recommend brewing it lightly, around 55 seconds, and then letting it cool enough so that it can be drunk with substantial amounts in the mouth (rather than small sips). Definitely more ´sophisticated´ taste and longer, less vegetal aftertaste, than regular long jing. Value for money? probably not so much for the average tea drinker. WONDERFUL, OUTSTANDING, INCREDIBLE. My first brew of this tea was literally the best tea I have ever tasted (and I´ve tried at least half of Teaspring´s stock). In addition to the cereal nutty signature taste of long jing, it had a remarkable unequalled sweetness. Delicious to roll around the mouth and tongue. Disappointing, have been ordering the regular Long Jing for years and thought I would treat myself. I did not find this tea to be any better, perhaps even less flavor. Maybe i ordered at the end of 2011, so the texture, fragrant, color, and taste not as good as first harvest. Many broken leaves and the leaves color are not uniform. But I can´t wait until spring. Excellent long jing, fresh & strong as usual. Our daily favorite green tea. This tea is wonderful. I´ve looked in tea shops throughout the NY/NJ area, including "Chinatown", and can´t find anything that comes close! The first serious green tea I´ve ever tried. A very pleasing, complicated bouquet, somewhere between spicy and fruity. It has a warming, full flavour, perhaps even rich. The second infusion remains warm, palatable and pleasing. As one would expect, one of the best green teas available - wonderful. Seems to be only average this year. Lack the usual aftertaste which it´s supposed to be famous for. A little more cereal than last years. Still not as cereal as emperor LJ of this year. This LJ has a beautiful fruity/citrus character that makes it a very refreshing green. I think I still prefer the emperor slightly. long jin is my favourite tea. in this case, once more, I cannot than confirm the incredible parfume and excellent taste of this amazing product. This is a very good quality of Long Jing. Leaves are large and flat and vary from olive to bright green. The first infusion is light brown green and has a delicate grassy fragrance, though not as strong as that of the emperor. The flavor is more robust and simpler than that of the emperor. This is an excellent multifaceted Long Jing that makes a very smooth brew that is strongly aromatic with a nutty full-mouth feel flavor. Highly recommended -- I prefer this over Teaspring´s "Emperor" Longjing. very good quality,smooth taste, exactly how it is described.The best. One of the best all round Long Jing i have had for a few years. It doesn´t have that amazing cereal complexity of the emperor lj. This lj is far broader in taste, in fact it seems to have a little of every type of LJ i have ever tried! Incredibly complex, organic evolution throughout the brews. Will certainly buy again. Taste good with a quick aftertaste of nutty flavors. It is easy to understand why this is China´s #1 tea. Been buying this one for the last 3-4 years. Have always liked it up till now. Was very surprised that it didn´t come in the original Shi Feng packaging like it did in the past. The tea itself is fragmented into smaller pieces. One bud to 2-3 leaves instead of the usual 1bud to 1-2 leaves. Taste wise, it´s too light. It has a nice, pleasant aroma and a ´nutty´ taste. A very good Long Jing indeed. This is a nice longjing. Refreshing and honey aroma, and tastes like chestnuts, but it is too light for me. This is a good tea. The aroma is nutty and earthy, but very good. the taste is lighter and refreshing. It tastes very clean and is not too strong or overpowering. I really enjoyed it compared to other green teas I have tried. One of my favorite Long Jings, more fragrant than most other Long Jings. Lovely Long Jing that is refreshingly creamy and smooth. No edges or bitterness to the tea at all. A beautiful greenish cast to the first few infusions. The leaves are extremely fresh. I got more than three infusions from my gaiwan. Very nice Long Jing! Last year was better for me, although this one is fine too, it wasn´t as strong in dry aroma, and overall taste. It is good quality, and much improved from last year. Another good year of tasty Long Jing although lacking the aftertaste which was stronger in last year´s Spring edition. Overall good. I wish I could rate this as well as the tea I received from another company sampler, but I cannot. I tried brewing at 175F for 1 minute, then 2, then 4 with different fresh leaves, but every infusion didn´t have the "savoriness" that I got when I first tried Long Jing. Maybe it is because these leaves aren´t fresh...it is almost a year since spring harvest. I will not purchase this brand again because it just didn´t have a unique taste and second infusions were even more tasteless. A bit disappointed, with the smell of the the dry leaves being strong as they were, the cup was a complete surprise. Nevertheless its good. This is a good green tea, but I find it finicky to brew. I had one cup with a wonderful lasting flavor, but by and large, I´ve been unimpressed. It´s still good tea, but I´m not sure it´s worth a premium. I ordered Shi Feng Long Jing, the most famous green tea in China. In terms of the quality, it is blow my expectation at this price. Be warned that the standard shipping is slow, I placed my order on Oct 23, got it on Nov 06.
the scent is very nutty but does not have the sweet aftertaste that i expected. Delicious slightly nutty green tea. Beautiful well-shaped leaves. Very good tea but it did not raise at the level of my expectations. excellent delivery time. and the tea smell and taste like some good weed lol. A very good tea, easy to see why it´s one of the top Chinese teas. Definitely one of my old standbys to drink everyday. For a beginer I would say it´s a special tea, with a surprising "royal" taste, smooth, with sweet aftertaste.The word is GREEN,fresh,young forest.This one..I would buy it again! Sweet tasting green tea. Slightly stronger flavour compared to previous Long Jing I dranked in the past. Definitely thumbs up ! I have tried very hard to love this tea (2008 harvest). I´ve brewed it short with lots of leaves, long and light, warmer, cooler and everything in between. I get a bit of grass and citrus, and a decent gan, but not the subtle complexity of a fine Long Jing. The overall body when brewed at 2grams for <4oz at 160-170f (my best result) is almost clear, with a hint of green. A nice tingle to the tongue and a hit of grass as it cools in the glass. 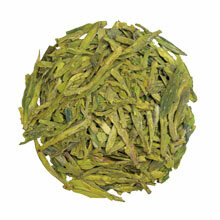 Not sweet or nutty, and doesn´t seem to hide buried treasure in its light body like a Tribute Long Jing. Brewing for more taste can easily create a cup that is a bit too se, especially for such a light tea. I can coax a cup I like better more easily from the cheaper Long Jing. A nice fresh authentic long jing for the price. Very good fragrance and taste. However, it is just a little thinner than usual. Excellent quality of whole green tea leafs, terrific taste. Well worth its money. Brilliant tea with a wonderful gentle aroma! Best green tea i´ve tasted so far. very refreshing without being too astringent. After the first cup i can´t never stop me! No doubt it´s an excellent green tea and #1 tea in China. Received two good Dragon Well this year. The quality is much better the the previous years. Without question, it is the best green tea I have ever had. My favorite tea. Nice fresh taste, always keeps me alert. The ´08 spring harvest has a definite citrus smell, echoed more faintly in the liquor. Very fresh, beautiful leaves. Good tea with nice taste and good afterstaste. Recommended for a perfect refresh. A delicious nutty green tea. I wouldn´t hesitate to buy it again. This tea had a nutty and sweet aroma, and I thought it was a good value for the price. The leaves were very nice too. A high quality Long Jing tea with very fresh taste. It reminds me of what green tea should be, but just like almost all green tea, it doesn’t last very long since the leaves are not processed as much as the other type of tea. Also, the flavor changes with each infusion, usually with the second round being the strongest. Fantastic taste; fresh and with that signature longjing flavor. Stands alongside Emperor longjing as my favorite longjings of 2007. I prefer this long jing over the emperor long jing. This one has a degree of the poached rice element that I associate with traditional long jing. I like to steep this one around the 170F mark for a very vibrant flavor. The aroma is wonderfully abundant. A very clean and delicious taste. Vegetal and reminiscent of fresh asparagus at first sip; then, a long sweet finish. Nothing "kelpy" here! Not astringent and somewhat citrusy. Perfect for a summer afternoon with meringues. Delightfully refreshing. Unlike most greens it can take longer infusions with cooler water. Just lovely! Great tea with great taste. I tried many Chinese supermarket for good Chinese tea but failed. Finally I found this site by searching google. a very smoooottthh tea - no jagged or hard edges to the taste. slightly vegetal and sweet. nice. Really great--beautiful, large leaves, with a hint of white down. Mellow and (I don’t usually notice this) actually vegetal taste. Recommended for a fine long jing. WOW, really excellent. Nutty, and slghtly vegetal and floral. The dry leaf is very aromatic and just comes alive in my preheated teapot, offering a nice robust aroma. This carries over as soon as hot water is poured over the leaf. A great Long Jing experience. It is a nice tea, this is the first time I have actually tried it. The tea has a nice nutty aroma and is a complex flavour. Although I don’t think this tea is much of a tea for me, it still doesn’t change the fact that it’s an excellent tea. very pleasing soft like the gentle sping bud that they are when i drink this long jing my mind drifts into peace and harmony. get some ,try and see if you can get the same. Grassy flavor is present but it is not unpleasant or strong. Nutty smell. A good tea. Wow. Like a bordeaux wine, at first sip, one asks what is so special. After a few more sips the answer is clear. So many answers, actually.